If you are looking for an eggless cookie recipe then help is at hand. Cookies are a very versatile food and as such, many egg free or even dairy free recipes are available. Cookies are enjoyed universally by people young and old. 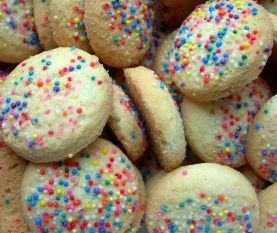 There are many different types of cookies and people have their own special recipes. While there are a wide range of styles of cookies, many are made using the same core ingredients. This includes flour, sugar, fats or oils, milk and eggs. Other ingredients such as chocolate, dried fruits and even candies are added to the cookie mix. The addition of eggs to the ingredient list can mean that this type of cookie cannot be enjoyed by someone on an egg free diet. People on a dairy free diet will need to look out for cookies that don't contain dairy fats and milk and vegans will need to be aware of this plus any other non-vegan foods such as honey. While this may sound like a minefield, cookies are such a versatile food and made in so many different ways that there is likely to be a recipe to suit every dietary need. There are many eggless cookie recipe ideas available and it is also possible to adapt a favorite recipe and make it acceptable for an egg-free diet. Before looking at cookie recipes that do not contain eggs, it is important to understand the role of eggs in cookies. Unlike cakes, where a light batter is required to make a cake that is not too heavy, cookies are made from a stiffer mix of ingredients. This means that cookies rise less when they are baked but retain a moist inside with a crisp outside. Traditionally, eggs have been added to the cookie mix to help to give a moist yet light cookie. Many cookie recipes can be adapted for an egg free diet. There are many egg replacements that are suitable for using in cookie recipes. These include commercially available egg substitutes as well natural egg replacements such as bananas, zuchinni or nuts and seeds. If you are using a commercially prepared egg substitute then simply follow the instructions on the pack. If you are using another form of substitute then remember that this may alter the finished taste of the cookies. RecipeZaar - there are over 250 recipes for egg free and vegan cookies on this site. This includes recipes for old favorites as well as more unusual variations. AllRecipes - this website has a range of different cookie recipes. These are rated by users which gives a useful insight into the experience of other cooks. VegWeb - VegWeb has several eggless cookie recipes. In addition to the recipe, visitors are also invited to post their comments and photographs. This makes this a useful resource for people looking for inspiration and cooking hints and tips as well as recipes. Add a spoonful of oil to the cookie mix instead of an egg if you don't have any other form of egg substitute close to hand. Keep egg free cookies in an air tight container. This will help to keep the inside moist and the outside crisp. If you are making vegan as well as egg free cookies or brownies, remember that ingredients such as chocolate chips may not be suitable for vegans. Cookie recipes are often scalable. This means that you can make larger batches of your favorite recipes or smaller batches of recipes that you are yet to try.